A new bill would require officers to use deadly force only when it is necessary to prevent serious injury or death. California lawmakers, backed by civil rights groups and the family of Stephon Clark, announced Tuesday that they would try to raise the legal standard for officers' use of deadly force, a move they say could curb the number of deadly police shootings and make it easier to prosecute them. 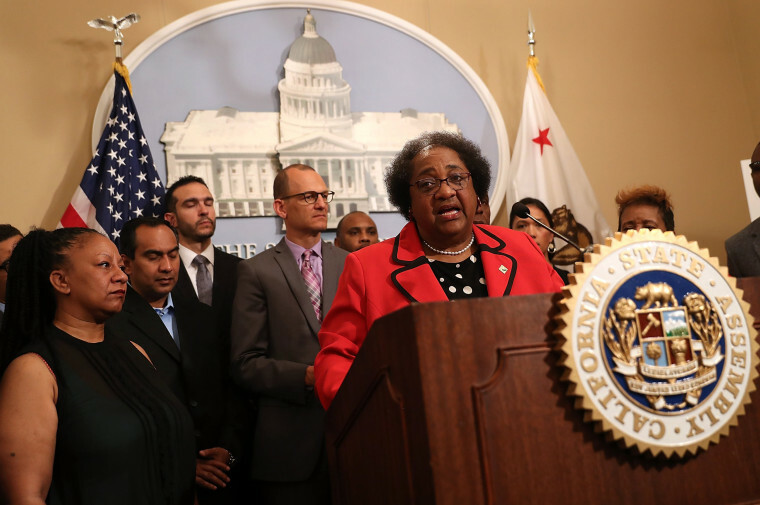 Their bill, introduced in the aftermath of Clark's March 18 shooting death by officers in Sacramento, would require officers to use deadly force only when it is necessary to prevent serious injury or death ─ and only when there was "no reasonable alternative," according to state Assemblywoman Shirley Weber, a co-author. That's a tougher legal hurdle than current California law, which is similar to minimum standards set by the U.S. Supreme Court. That opinion says police can use deadly force whenever a "reasonable" officer would do so under the same circumstances. "This standard provides legal cover for killings that can be reasonably justified under the law, but were not necessary," according to Weber's summary of the bill. Weber said she wrote the proposed new standards after being inspired by "the energy" of protesters who have taken to the streets of California's capital since Clark, 22, was shot to death by two police officers responding to reports of someone smashing car windows after dark. "It is time now that we as legislators match that energy and do the right thing in pushing for smart and effective reform," Weber said at a news conference. In video captured by the officers' body cameras, they corner Clark in his grandmother's backyard, and one shouts "gun" repeatedly before they open fire. But Clark was not armed; officers found only a cellphone on him. A pathologist hired by Clark's family said last week that seven of the eight shots that hit him entered his body from behind; an official autopsy has been completed but has not been released pending toxicology results. newsmento officers who shot Stephon Clark mute their bodycams? SHARE THIS — NEWS Why did Sacramento officers who shot Stephon Clark mute their bodycams? Weber said she modeled the bill on a 2016 report by the Police Executive Research Forum (PERF), which helps police agencies develop and share ways to improve their work. The report encouraged police agencies to adopt use-of-force policies that go further than the standard set by the 1989 U.S. Supreme Court opinion in Graham v. Connor. In that ruling, the court said police force should be deemed "reasonable" under the Fourth Amendment of the U.S. Constitution ─ which protects against unlawful search and seizure ─ only by judging "from the perspective of a reasonable officer on the scene, rather than with the 20/20 vision of hindsight" and by taking into consideration "split-second judgments" about "the amount of force that is necessary in a particular situation." PERF recommended police agencies adopt a standard that focuses on whether deadly force is necessary, and "proportional" to the threat an officer faces. The report also stresses that officers use "de-escalation" techniques. David Harris, a professor at the University of Pittsburgh law school and a scholar of police behavior, said Weber and her co-sponsors are effectively saying that the federal standard "is not good enough for us." A number of cities and police agencies have adopted stricter standards, including Chicago, he said, though some police groups have opposed the measures as potentially putting officers' lives at risk. Shaun Rundle, deputy director of the California Peace Officers' Association, said he had not seen an official version of the bill, and so couldn't comment on specifics. But he said in an email that "California law enforcement is aware of the heightened desire to see changes regarding policing in this state" and was willing to "facilitate these discussions." Rundle also said it was inaccurate to assume that officers don't already consider all reasonable alternatives before resorting to deadly force. "We must look at each case individually, as an officer’s mindset as well as what they perceived to be threats in any given situation are not always accurately depicted on audio or video footage," Rundle said.